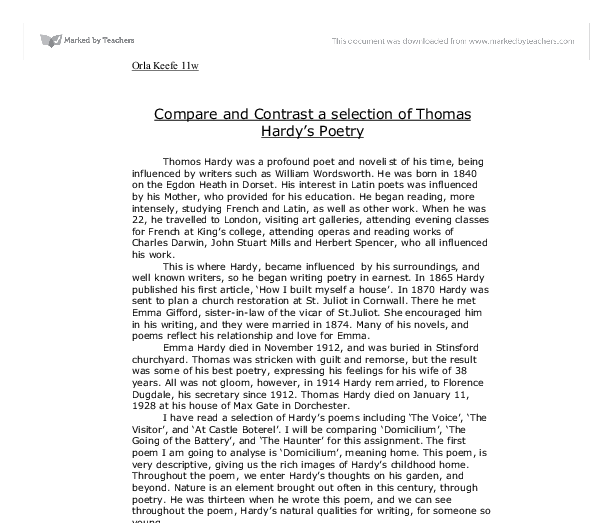 Compare and Contrast a selection of Thomas Hardy's Poetry Thomos Hardy was a profound poet and novelist of his time, being influenced by writers such as William Wordsworth. He was born in 1840 on the Egdon Heath in Dorset. His interest in Latin poets was influenced by his Mother, who provided for his education. He began reading, more intensely, studying French and Latin, as well as other work. When he was 22, he travelled to London, visiting art galleries, attending evening classes for French at King's college, attending operas and reading works of Charles Darwin, John Stuart Mills and Herbert Spencer, who all influenced his work. This is where Hardy, became influenced by his surroundings, and well known writers, so he began writing poetry in earnest. In 1865 Hardy published his first article, 'How I built myself a house'. In 1870 Hardy was sent to plan a church restoration at St. Juliot in Cornwall. There he met Emma Gifford, sister-in-law of the vicar of St.Juliot. She encouraged him in his writing, and they were married in 1874. Many of his novels, and poems reflect his relationship and love for Emma. Emma Hardy died in November 1912, and was buried in Stinsford churchyard. Thomas was stricken with guilt and remorse, but the result was some of his best poetry, expressing his feelings for his wife of 38 years. All was not gloom, however, in 1914 Hardy remarried, to Florence Dugdale, his secretary since 1912. Thomas Hardy died on January 11, 1928 at his house of Max Gate in Dorchester. I have read a selection of Hardy's poems including 'The Voice', 'The Visitor', and 'At Castle Boterel'. I will be comparing 'Domicilium', 'The Going of the Battery', and 'The Haunter' for this assignment. The first poem I am going to analyse is 'Domicilium', meaning home. This poem, is very descriptive, giving us the rich images of Hardy's childhood home. ...read more. Only time will tell, but we sense in this stanza, that they think of the worst. The poem only refers to war, in the way it represents danger to the men and possible heartbreak to their wives. War is only present by the contrasting attitudes of the men and their wives, that war is exciting to soldiers but distressing to their wives, who try to come to terms with this distress, realizing that marrying soldiers necessarily involves risks, sorrow and mourning, feelings that they now have as voices haunt them 'in the night-time when life beats are low'. The poem throughout is a descriptive account, of a wife losing her husbands presence in their lives, and maybe forever, as they risk their own lives '..in far battle, beyond the South Sea!'. It is a contrast to 'The Domicilium', as this was a tranquil, feel good poem, with images of Hardy's garden, and the thoughts of nature and his late Grandmother. The comparison with the loss of losing his Grandmother, mirrors that of the wives losing their husbands. However, Hardy looked back on his Grandmother, with happy and memories that have stayed with him. This will not be the case for the wives, if they in the end do lose their husbands. Being a widow, would generally in that century, mean that you would be alone forever, left to mourn. The poems also, both have a different structure. It shows the vast ability Hardy had, being able to use the different skills of writing. It is impressive to be able to put yourself in the mind of someone else like in 'The Going of the Battery' like Hardy did, showing that he often thought of how people would feel, and have empathy for them, just like we do when we read this poem. In 'Domicilium', however, it is from the prospective of Hardy. From both of the poems, you can see how much Hardy has changed in his style writing since 'Domicilium', and how he has progressed immensely upwards. ...read more. This is how Hardy hope she feels, and needs to believe this to be able to go on. This is similar to 'The Going of the Battery', as the wives have to have hope and courage, that one day they will see their husbands again, and be reunited 'for one kiss'. 'Domicilium' is different from both these poems, as it is from Hardy's point of view. However comparisons lie between them all, as the closeness between his garden, is mirrored with that of his relationship with Emma. 'The Going of the Battery' and 'The Haunter', is from someone elses point of view, and is full of emotion and feelings of the voices behind the language. His language and imagery is very powerful, that we can sometimes imagine just what he is imagining in his own mind, when he wrote the poems. This is shown very well, in the 'Domcilium' of the images of his garden and beyond. The three poems that I have analysed are excellent examples of his ability to show the universal emotions of loss, missed opportunities, and love, to create works which are both powerful and disturbing to the audience. In 'Domicilium' one of his earlier works, is more of an account of his garden and the fields beyond it. Since this poem, when he was thirteen years old, we can see how much he has developed in his works, being able to put himself in the thoughts of someone else and be able to imagine things that are not really there, like Emma's spirit in 'The Haunter'. He brings across the feelings of the human spirit, that while reading them, the audience can relate to and empathize with. He is a profound poet and novelist of his time, and even reading these poems today, the ideas and thoughts he had are still relevant, and this I think is Hardy's main quality in writing, and when reading them they come alive once more. ?? ?? ?? ?? Orla Keefe 11w ...read more. 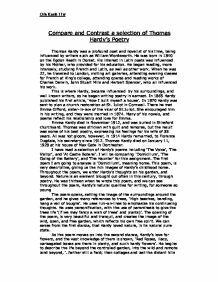 This student written piece of work is one of many that can be found in our GCSE Thomas Hardy section. How does Hardy portray the themes of loss and loneliness in his poems? Pathetic fallacy is a strong poetic device to use in a poem as it is using the weather to parallel the mood of the poem or poet. One quote would be "Leaves around me falling" and this shows that Hardy is using seasons as metaphors; for example winter emphasises loss and death whilst summer emphasises happiness. The use of enjambment to link to the fourth stanza adds the effect to a natural speech. The narrator reflects that the man he killed probably "thought he'd 'list" because he had no other work and had sold his belongings. "At Castle Boterel" was the second poem we studied. All the verses have the same amount of lines and have the same rhyming scheme, which is ABABB. By having a rhyming scheme it gives the poem more rhythm. Here is the first verse from the poem where you can see the rhyming scheme. This disjointed rhythm in 'Neutral Tones' shows that Hardy is devastated about his girlfriend leaving and his feelings are faltering between anger and bitterness. It ends with a very slow but staggering rhythm, which I feel is suitable to the poem. So when he is wishing for his heart to shrink too, it?s so he would no longer feel any strong emotions. You would expect a lover to be able to remember at least facial features! This lack of distinction is to be later explored. Hardy introduces his ideas about perspective and sight in this stanza. He introduces key renaissance optical theory in the line ?down that diminishing platform bore?.